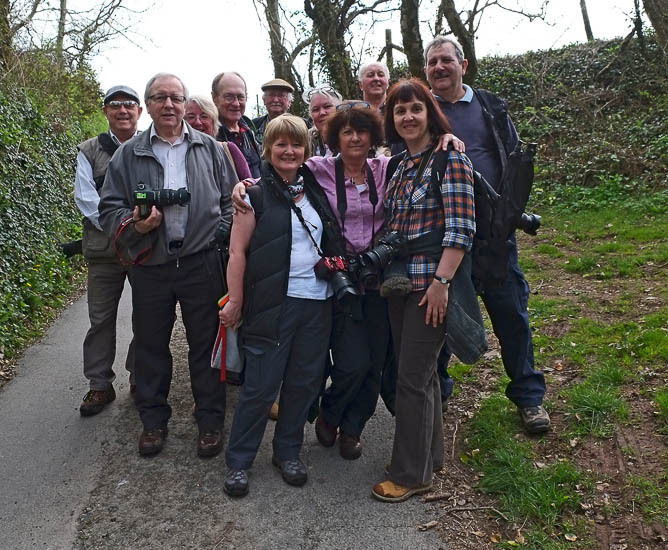 13 members of Morriston Camera Club met at 8.30am in ASDA car park on a gloriously sunny Sunday for our field trip to Laugharne. We arrived at 9.20am and set off on Dylan's Birthday Walk led by Tony Llewellyn. It was a beautiful, scenic walk & the whole group were in high spirits. We walked uphill, up steps and over stiles and got some beautiful shots of Laugharne. Layers were shed as the weather became warmer and we agreed we had had the best day of the weekend to visit. We posed for some group photos before deciding to head back and visit The Owl and The Pussycat tea room where we enjoyed some much needed refreshments. It was at this point we realised that one of our party - Brian Ballard - was missing. Thankfully, he turned up shortly afterwards safe and sound much to our relief. Our next area of interest was Laugharne Castle where we had some unexpected horses and riders who were very photogenic against the castle backdrop. This was followed by a walk to Dylan's writing shed, this could only be photographed from outside which was a shame as it would have been good to go inside. We then walked down the steps towards the Boathouse and made our way back towards the car park. We were joined here by our 14th member, Dorian Phillips and said goodbye to Graeme Clark & Sian Sullivan who both had to leave. We proceeded to drive to the Carpenters' Arms pub for Sunday Lunch where much light-hearted banter was exchanged. As we were all enjoying the day we decided to drive to Amroth and Wiseman's Bridge to look for some photo opportunities before heading home. An enjoyable day was had by all, brilliant company and lovely weather. Who could ask for more?